Review posted November 13, 2016. Skylight Paths Publishing, Woodstock, Vermont, 2016. 178 pages. Full disclosure: The author of this book is a long-time friend of mine. In fact, this past week I was writing my Project 52 post about the year I was 20, and the post included several pictures of Gina at Disneyland. We had invented the S.I.K. Club -- a group that wasn't afraid to be silly and whose theme was Joy. And a couple days after posting that, something Gina said in this very book blessed me. Camino Divina is lovely. It took me a long time to read it, because I started reading a short section every time I go for a walk, and I usually only go for a walk two or three times per week. But it has added richly to those walks, and I plan to go through it again. What is camino divina? 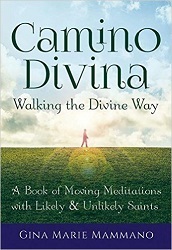 Well, since camino simply means "road" and divina means "divine," the pair of them together could be thought of as "the path of the Divine" or "the divine way." It's a merging of the Spanish camino and the Latin divina, a lingua marriage of sorts. In my vernacular, it just means taking a meaningful stroll out in nature, on a labyrinth, under the moon, with divine words laced in rhythm along with it. She's talking about taking a phrase with you and mulling it over as you walk. This book is designed to take you on a journey -- no, many journeys -- of both outer landscape and inner landscape. The outer landscapes are all around you and can be explored through a well-planned or serendipitous trip, a pilgrimage to a sacred site, or a meandering somewhere in your own neighborhood. The pith, though, is found in the inner landscape. That is something you take with you wherever you go. It is your inner self, the very soul-housed uniqueness of time and space that you bring into the world and bring into your life's experiences. I've created twelve adventures that give you the chance to traipse into both of these realms -- the inner landscape and the outer landscape. On each adventure I've paired you up with a spiritual guide whom I call a "saint" -- a sage who has spoken inspiring words and ideas into my soul and out into the world. I've then chosen a theme that highlights one aspect of the featured sage's wisdom and legacy, but by no means encompasses it. As you wander into themes like Amazement, Wildness, Darkness, the Liminal, the Surprising, or the Familiar, know that they can be explored not only with the saint associated with that particular theme, but with the others as well, serving as launching points for you to explore many other possibilities in your camino divina practice. When you've finished this book, I encourage you to create a list of your own "saints," those whose words and thoughts have inspired -- and continue to inspire -- you. Gina's writing is beautiful -- She's a poet -- and she opens windows into the words of these twelve writer-saints she's chosen. I've been walking with these meditations for months now, and they've opened my eyes. And I know if I make the journey again through this book, I'm going to uncover all new riches.